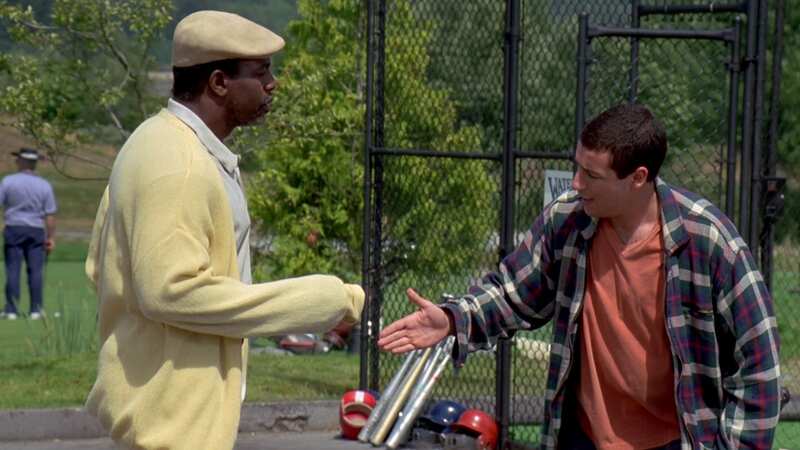 Happy Gilmore has been voted the best Adam Sandler movie of all time… is it a surprise to anybody? The 1996 classic, which was released 22 years ago today (February 16), was a huge success, raking in an impressive $41.2 million at the box office, despite having had just a $12 million budget. If somehow you’ve managed to never see this film, you probably need to! And because it’s been more than 20 years, it’s way past any kind of spoiler alert like this one. The film follows the story of aspiring ice-hockey player Happy Gilmore (played by Sandler), who despite having a ‘good slapshot’, has an aggressive streak and isn’t the best skater – which prevents him from getting in the team. He then finds out his grandmother, who raised him after his father’s death, has not paid her taxes for many years and subsequently, owes $270,000 – because of this her house is about to be repossessed. Happy has only 90 days to come up with the money, otherwise Grandma Gilmore’s house will be auctioned off – she’s temporarily put into a care home while removal men take out the furniture. While repossessing his Grandma’s furniture, the removal men challenge Happy to hit golf balls for a bet. Happy hits the ball 400 yards three times, winning $40. Happy then starts hustling golfers with his swing at the driving range, which leads to former golf star, Chubbs Peterson, to convince him to enter a local tournament for a chance to win some ‘big bucks’. He wins the local tournament and earns a spot on the Pro Golf Tour, but is advised by Chubbs to wait six months so he can improve Happy’s performance. Yet because he knows he has to win the money before his Grandma’s house is auctioned off, he enters the Pro Golf Tour anyway. In the tour, Happy encounters Shooter McGavin, who sees Happy as both a detriment to golf and a threat to his career, so he tries to get him expelled from the tournament. PR head Virginia Venit convinces McGavin to reconsider, citing higher television ratings, increasing attendance and a way of drawing more youthful sponsors – she then adds how she’s willing to work with Gilmore on his ‘anger issues’. Despite bidding $275,000 from his endorsement deal with Subway at the property auction for his Grandma’s house, Happy is outbid by McGavin who buys the house for $350,000. Happy goes back to Chubbs to ask for help – and to apologise for going ahead with the tournament – and they go to a mini-golf course. Happy makes good progress and later that night in his apartment, he presents Chubbs with a gift – the head of an alligator which had bitten off his hand, years ago. Chubbs is startled by the present and backs up, but in doing so, he falls to his death through an open window. Determined to win the tournament in honour of Chubbs, Happy wins using a trick-shot he’d learned from his late mentor. It all ends with Grandma Gilmore getting her house back. All sounds about right to me!